The UFO seen at the El Yeso Reservoir was twice the size of the National Stadium. The photo of an alleged UFO in Chile has left more than one viewer startled after that country’s Comité de Estudios de Fenómenos Aéreos Anomalos (CEFAA) confirmed its authenticity. The image was taken in the area known as El Yeso Reservoir by a Venezuelan couple living in the southern country. The image was investigated by CEFFA through its director general, Gen. Ricardo Bermudez (Ret.). “After considerable research time we reached a series of conclusions that are the same obtained in the United States, and which are: this photograph is real and not a hoax; Second, that the incidence of the light in these clouds is the same as that which falls upon the object; Third, that it has its own light, and therefore a series of portholes are visible. This is according to our Ph.D in meteorology, and according to the clouds existing at the time during that season in the Cordillera, makes it twice the size of the National Stadium (in Chile),” he told Terra Chile. 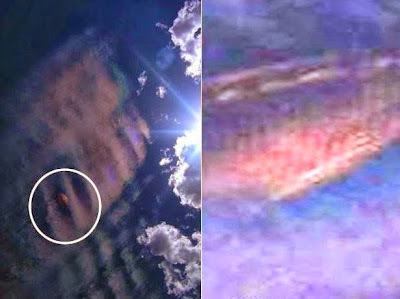 “We do not know what it is or where it came from, but the anomalous aerial phenomenon described as an unidentified flying object is real and we have the proof and the eyewitness accounts to support it,” notes Bermudez, who was a military pilot for the Chilean Air Force, flying F-5 fighters among other craft. CEFAA, created in 1997, is an agency of the Technical Aeronautics School (ETA), a body which went on to become a branch of the General Secretariat of the General Office of Civil Aeronautics in Chile. Now this was totally interesting. We all know they are out here checking on us. Good report Frank.